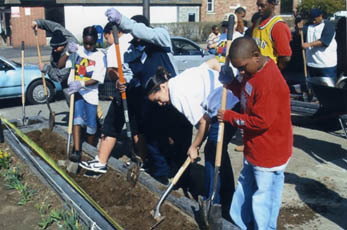 Neighborhood youth get street planters ready for spring flowers at the corner of Laurel and Farmington Avenue. This corner has been transformed by community volunteers with assistance from the Alexander A. Goldfarb Memorial Trust. The Farmington/Asylum Avenue merge at the edge of downtown were be part of a large scale planning effort led by the Metro Hartford Alliance and City of Hartford, with support from many business and civic partners, including the Farmington Avenue Alliance. A team of urban planners, economists and transportation engineers under the direction of Ken Greenberg examined how to create lively, hospitable gateways to the downtown, from the major streets that radiate from the city’s central core. Better connections between the city and its suburbs, lively and pedestrian-safe public spaces, reclamation of tracks of land in the North and South Meadows and development of urban greenway networks located next to watercourses leading into the city were the main focus of the planning initiative. For more information on Hartford 2010.